As part of CAIS’s “Authentic International Learning” strategic initiative, each year we send around 100 students to China and Taiwan for intensive, language-and-culture-focused educational experiences. 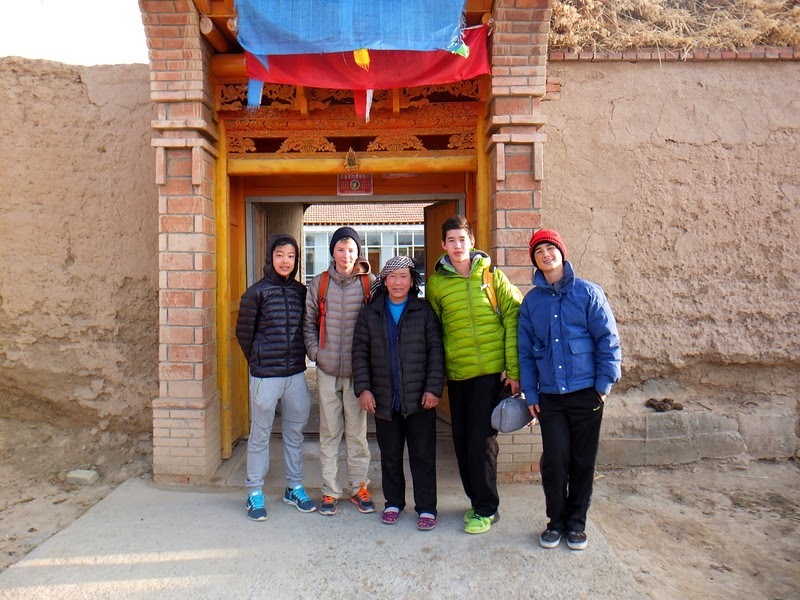 One such experience is the 8th grade journey to the Tibetan plateau. 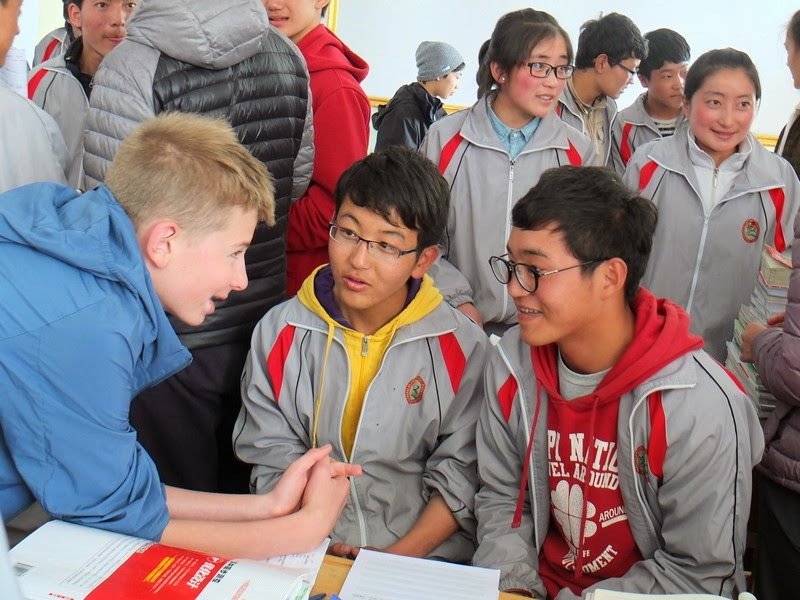 This year, for two-weeks in April, CAIS International Programs Director Jonas Crimm led 19 8th grade students to areas of Qinghai and Gansu provinces where Jonas lived and worked for three years with local Tibetan populations. He was assisted by trip leaders Alice Woodman-Russell (7th/8th grade social studies teacher) and Debbie Talbot (PE teacher and athletic director). My words cannot begin to capture the richness of this trip for our students, so I am re-posting all the trip blog entries from Jonas, Alice and Debbie. This is a long read, and absolutely worth the time. Enjoy! 8th Grade Trip 2015: Arrival in Xining! 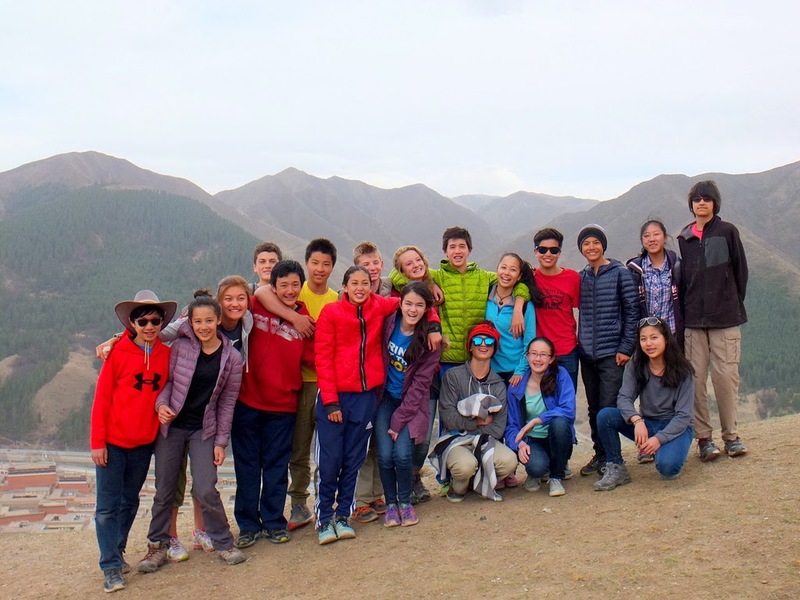 Nineteen CAIS 8th graders arrived in Xining yesterday after a multi-day journey from San Francisco. Despite the exhausting duration of the travel, the students were in great spirits and energy upon arrival, immediately venturing forth from the hostel to visit nearby small shops in search of various snacks and drinks. The voyage here included two airplane flights separated by a quiet night at a Beijing airport hotel. The hotel, a large faux-marble monstrosity, was quite comfortable, if somewhat oddly placed in the middle of nowhere amid small steel plants and wheat fields in the nearby semi-countryside. Upon arrival, I took some students on an excursion to find a store for refreshments, which entailed walking down a dark country road and crossing some train tracks attentively manned by light saber-bearing attendants. After a quick two-hour flight to Xining the following morning - which included fantastic views of the Gobi desert and Qilian mountains - we arrived, met our guides, and went directly to the 16th-floor Lete Hostel. After settling in (for which most students meant playing pool), we walked into downtown to get lunch in our chaperone groups at a local market. The students filled up on various traditional foods and snacks: beef noodles, buns, pumpkin cakes, ‘burritos’ (a tortilla of sorts filled with delicious veggies and noodles), yogurt, and more. Full to the brim, we headed back to the hostel for a relaxed afternoon. While students decided to hang out around the hostel, Debbie Talbot and I decided to walk up the hill to Nanshan Park, a relaxed city park marooned on a hilltop overlooking the city. We had a nice time poking around and observing an under-construction ski slope before heading downhill past Nanchan temple to the city. Dinner - at a nearby hotpot restaurant - was delicious, with self-serve sauce options and individual pots. The vast amount of food was consumed in near entirety before we headed back to the hostel for a bit more relaxation. Yesterday was designed to get everyone back on their feet after a long period in transit. Today, the programming begins in earnest, with a citywide scavenger hunt in which chaperone groups will search out information by traveling all over Xining. I’m hoping to find time to post pictures but our chaperone group will keep you updated either way! Adventures aplenty are in the pipeline. Yesterday was a day of exploration, discovery, excitement, randomness, and unexpected encounters. 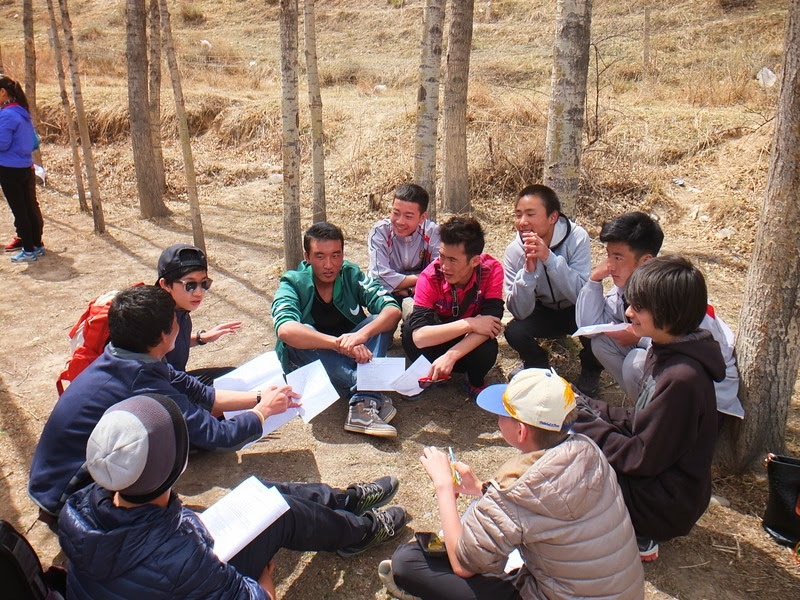 In small groups, students explored Xining (the capital city of Qinghai province) to gain a feeling for the place and for daily life in a provincial Chinese city. Criss-crossing the city on foot and public transport, students visited cultural and historic sites, ate local specialties at food markets, wandered through shopping districts, and talked with a variety of local residents about their lives and experiences. But first, the all-important meal of breakfast. After a restful night of sleep (and a light snowfall), students broke into small groups and went out in search of food. Students came back raving not only about the delicious dishes they’d sampled - ranging from zha jiang mian (noodles) to baozi (buns) to youtiao and doujiang (dough sticks and soy milk) - but also about the prices: my group, for example, couldn’t believe that we had been able to satiate the appetites of eight people for only 42 RMB (less than $7 USD). After breakfast, we came back to the hostel to discuss the day’s plan. Each group was assigned three to four places to visit; at each place, they had to learn about their surroundings, learn the significance of the site, and interview locals. Approved modes of transportation were limited to buses and walking. While chaperones and guides accompanied the groups, the adults were forbidden from helping the students find their way around: instead, the 8th graders had to rely on a map and their own language skills to ask locals for guidance. After wandering around aimlessly for a bit, the students quickly discovered that they could learn much by asking some simple questions. Within the first half hour, all the groups were on buses to their first destinations. Each group was assigned a cultural/historic site to visit, along with a food market, a park, and a shopping area. Ms. Woodman-Russell’s group explored the Dongguan Grand Mosque, the Muslim Market, and the underground market; Ms. Talbot’s group pushed through a chaotic furniture market to discover the cliff side cave temples of Beichan Si, wandered through Central Square, and ate their way through the Shuijing Xiang market; Mr. Crimm’s group ventured deep into western Xining to visit the Tibetan Plateau Wildlife Zoo, had a delicious lunch on Koufu Jie, and visited chaotic and bustling Shangye Xiang market. 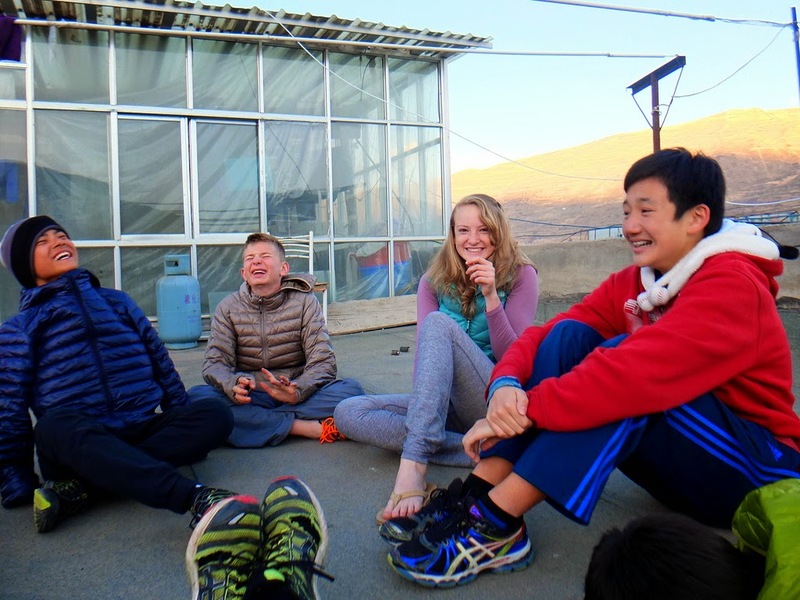 All the groups came back with stories pouring out of their ears, which - after a dinner of Sichuan food and some time on the public exercise equipment - were shared back at the hostel in entertaining fashion. The students were subsequently given a journal assignment and urged to pack their belongings for the following day’s departure. Today, we are heading up to Qinghai Lake. Internet might be even spottier over the next few days, and we pardon any inability to get in touch. We are a bit behind on blog posts…and apologize for the delay! 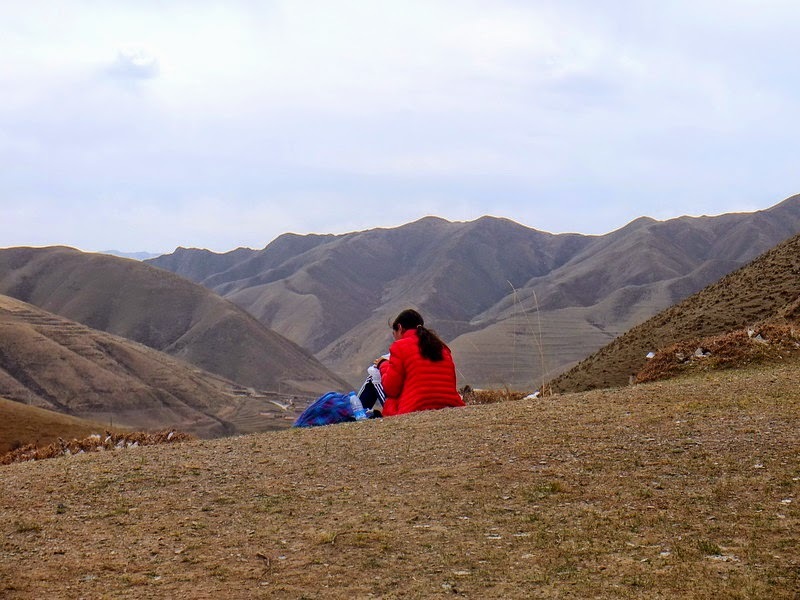 We’ve had a great time in rural Qinghai but at the expense of consistent internet access. Here is the first of three updates on what’s been happening. We left Xining for Qinghai Lake, stopping for a break at an unusually questionable bathroom along the way. As we ascended the Riyue Mountain pass, snow began to appear along the roadside; towards the top, the mountains were covered in a fresh layer of shining white powdery fluff. Cresting the 3500 meter pass - the traditional dividing line between the ethnically-mixed farming areas to the northeast and the vast nomadic grasslands of the Tibetan Plateau to the southwest - we found ourselves amidst beautifully barren grasslands populated mainly by herds of sheep and yaks and overseen by towering snowy peaks. We stopped by the ‘earlobe’ of Qinghai Lake (a small sub-lake at the main lake’s southeast corner) before driving to Namgyal’s nature preserve. Arriving at the beautifully remote preserve headquarters, situated between grasslands and sand dunes, several kilometers above the lake shore and overshadowed by snowy peaks, we were struck by the absolute quiet. After San Francisco and Xining, it was quite relaxing to be in a place where there was no ambient noise. We got settled in our rooms (and got used to the toilet) before a delicious lunch of veggies and meat dishes. After a short rest, we headed off on a hike towards the lake shore. Along the way, we saw a tent of monks in a meditation retreat, slid down beautifully rippled sand dunes, and viewed endangered black-necked cranes standing isolated amidst ponds and marshlands. Qinghai Lake is the largest lake in China. Arriving at the beach, we could not see the opposite shore of the lake (despite a clear blue sky). Students went wading in the surprisingly shallow waters, some making it out to a sandbar where they got an up-close view of the lake’s shimmering blue-green waters. After returning to the preserve HQ, we journaled individually before playing some Frisbee and hanging out on the roof of the guesthouse. We ate a dinner of noodle soup before playing the infamous ‘song game.’ Namgyal, the founder and manager of the preserve, came to talk to us about his efforts to preserve the local environment: lake cleanups, crackdowns on illegal fishing (much of which is done with underwater rockets), anti-desertification efforts, education, and more. We discussed the environmental issues facing this apparently pristine place - and had a quick check-in - before heading to bed. Waking up the next morning to yet another clear blue sky, I went on a run before meeting the students for breakfast. We then got ready to head up the road to plant trees in an area facing severe desertification. We walked up the road alongside pilgrims doing the once-in-twelve years circumambulation of the lake. Many do prostrations for the entirety of the 400-plus-kilometer journey: three steps, one prostration, three steps, one prostration - all the way around the lake, an act of piety which amazed our kids. We finally reached our tree-planting site, and spent the next couple of hours digging holes and planting trees in a place with an absolutely beautiful view of the surrounding area. After planting approximately 150 trees, we headed back to Namgyal’s preserve for lunch and then got in the bus to drive to our home stay village. The drive took us over a high pass with a beautiful view of the lake and its surroundings. We eventually descended to vast, treeless plains and finally found ourselves in Erthi, a midsize village of farmers and sheep-herders which would be our home for the next two nights. 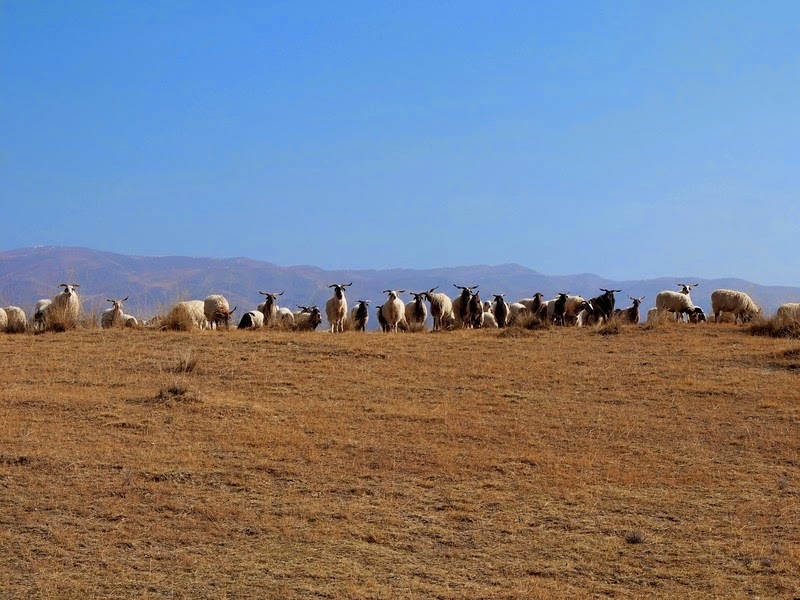 It was a three-hour drive from Qinghai Lake to Erthi village through plains, mountains, lots and lots of sheep and yaks to arrive into the tiny, quiet village of Erthi. The bus full of American students was very out of place amongst the earthen walls of the courtyards and animal pens. The roads were quiet except for the occasional motorcycle heading to the fields to help herd the animals for the day. As the students disembarked from the bus and entered the courtyard through the front gate. they were greeted by the host family. Students were shown their sleeping quarters. Each room slept 4-5 students per big platform bed. The bathroom was a typical outhouse in the country, which was situated outside of the courtyard in the field. This was quite the topic of discussion, but at this point the students were becoming used to the bathrooms in China. Students had some time to wander around the village before a homemade dinner of potatoes and noodles. The meals were cooked over an open flamed stove and all were delicious! During some of the student wanderings, many small baby animals were encountered and many local people were spoken to. Just off of the main “downtown” a local archery contest was observed. The day finished with a fun game of charades in the main gathering room. It was a great day according to the group! After a great night sleep under the village stars, the students slowly gathered for a breakfast of tea and tsamba- a local favorite of barley flour, milk tea, yak butter and dried cheese-and porridge for those not in favor of blending with the locals. After breakfast we broke into two groups based on interests. The first group was going to learn about herding. The second had wanted to go and watch at he local archery contest finals in the Village. Since I was a herding volunteer, I will fill you in on that adventure. One thing I’ve learned is that our guides don’t have a good perspective on distance. When they say something is 20 mins away, or 1 km it’s a really good idea to at least double (or maybe triple) the time and distance. But that’s another story. We were told that we were going for a “30 minute” hike to meet the sheepherder and his sheep. An hour of walking through the plains of dirt, tall dry grass, barbed wire, and beautiful rugged scenery we arrived at our destination. There were about 100 sheep and one herder waiting for us. We learned that herding sheep is not as exciting as it sounds. We hung out, told stories, read stories, and watched the sheep eat grass for about an hour. We even had time for a break out game of Ultimate Frisbee before it was time to head to our next destination for lunch only about “20 minutes” away to the next nearby village and brother of our host family. After a Mr. Crimm-led run and a Ms. Woodman-Russell-led yoga session (both of which garnered lots of funny looks from residents), our group ate a final home stay breakfast of rice porridge, hard boiled eggs, bread, and tea. Fortified, we piled back into our little engine that could and hit the road for Guide. What should have been under two hours of driving ended up taking over four hours including a stop for lunch, thanks to China’s slowest and most brake-happy bus driver. The hotel in Guide brought shrieks of delight from our group, which had been so horribly deprived of showers and Western toilets for four whole nights. 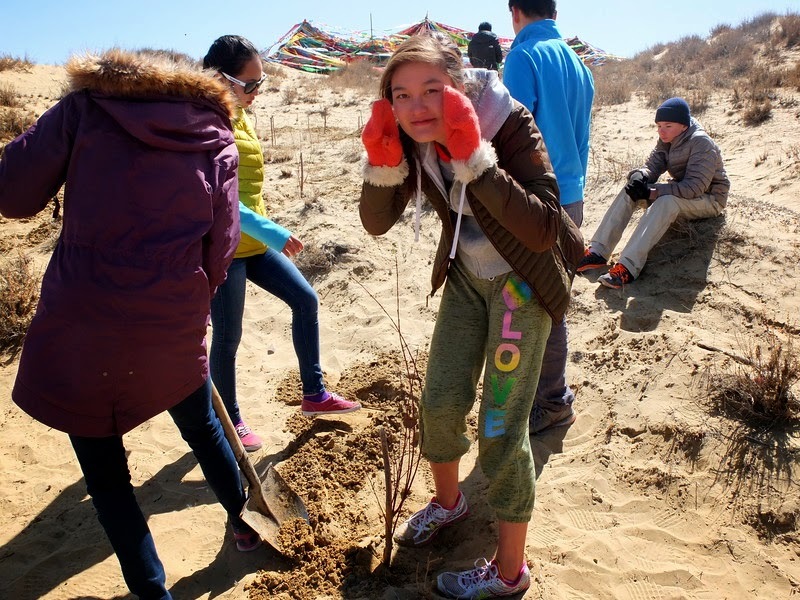 Students had free time in the afternoon to explore the town (serendipitously celebrating the pear blossom festival) and the neighboring Huang He (Yellow River). After a few minor incidents in room 207 (inappropriate toilet paper use and leaving room key in locked room), we gathered in the comically plush and golden — dare we say gilded — lobby of our hotel. Dinner was a hit. Mr. Crimm selected the dishes— a variety of spicy Szechuan vegetables, tofu, and meats. Our whole group sat at a massive round table equipped with the world’s largest lazy susan. The students were in a particularly boisterous, giggly mood. Perhaps it was the showers, the arrival in an actual town, or the return of the much-craved Wi-Fi?? After dinner came dancing to projected Chinese music videos in an adjacent outdoor area. Kenji tried semi-successfully to balance on Chris’s shoulders. Tristen eagerly scanned the binder of available karaoke songs in search of Taylor Swift. Just another night in China’s Wild West. Tomorrow we depart for a hike in Kanbula National Forest and Geological Park. With our favorite bus driver, who knows how long the drive will take. Then we make our way to Rebgong, our home base for the next four nights. The trip from Guide to Rebgong. The roads we had anticipated taking to Kanbula National Forest were inaccessible due to snow, so we opted to take another route from Guide to Rebgong. Once again, the landscape was spectacular. The students armed themselves with provisions, some purchased locally (chips, bottled milk tea, Future Peach drink) and some smuggled from the States (mint Oreos, Ghirardelli chocolates, Easter-themed M&Ms). Despite protests from some, the kids were forced mid-drive into the outdoors for snowball fighting and a walk down a snowy road, past a monastery and into a small village. To ease the burden of this arduous 1.5 kilometer journey by foot, our guides met us in the village with hot water, tea, and lunch. As a group, we devoured peanut butter, local honey, bananas, raisins, bread, sausage, and salty-sweet rice flour cookies. When we eventually reached Rebgong, we were all ready to get out of the bus and explore, or— for some of the more weary travelers— get out of the bus, login to Wi-Fi, and assess the hotel bathroom situation. A group of us walked the short distance from the hotel to the local Buddhist monastery, a massive, colorful complex where hundreds of monks study, practice, and live. Along the way, Mr.Crimm, who taught for two years at Rebgong’s English Training Program, encountered many adoring former students. Mr.Crimm is truly a local Beyoncé, unable to walk anywhere without attention from fans. After reconvening later in the hotel lobby, we walked to a nearby restaurant for a dinner of fresh, spicy Szechuan food, much like the meal we had eaten the previous night in Guide. Many platefuls later, it was back to the hotel for hanging out, WeChatting (to our great indignation wifi *only* worked in the lobby) and in some cases, eating more snacks (these teenagers are growing *a lot*). In due time, sleep happened, too. Sorry for the lack of updates: sickness among the chaperones and a busy schedule of activities has kept us away from our computers! What follows is an account of our time in and around Rebgong, the town in which I lived and taught from 2011 to 2013. Our first day in Rebgong (Sunday) was full: after a small-group breakfast, the students were sent off on a town-wide scavenger hunt that pitted boys against girls to find out information – some evident, some esoteric – about the region and its unique cultures. The students finished early by dividing the tasks among themselves, allowing for a leisurely lunch. For some, overly leisurely, as there were several late arrivals (read: some groups got lost!) to the meeting point for the afternoon activity: introductory worksheets, games, and music-sharing with local high school students from the Huangnan English Training Program – the magnet intensive-English program for rural students in which I taught while in Rebgong. Approximately twice as many local students showed up as there were CAIS students, so each CAIS kid was matched with two local students and the conversations began. Some went more smoothly than others, but the CAIS students quickly got the hang of ‘simple English’ – slow speech, easy vocabulary, hand gestures, and the like. The HETP students were initially shy, but quickly warmed up to the conversation. The students asked each other questions about their hometowns, school experiences, and daily lives. By the time the music sharing began, CAIS and HETP students alike were rocking out to everything from Sherten (a popular Tibetan singer) to Kanye West. After a full-group debrief, the kids split off into small CAIS-HETP groups. 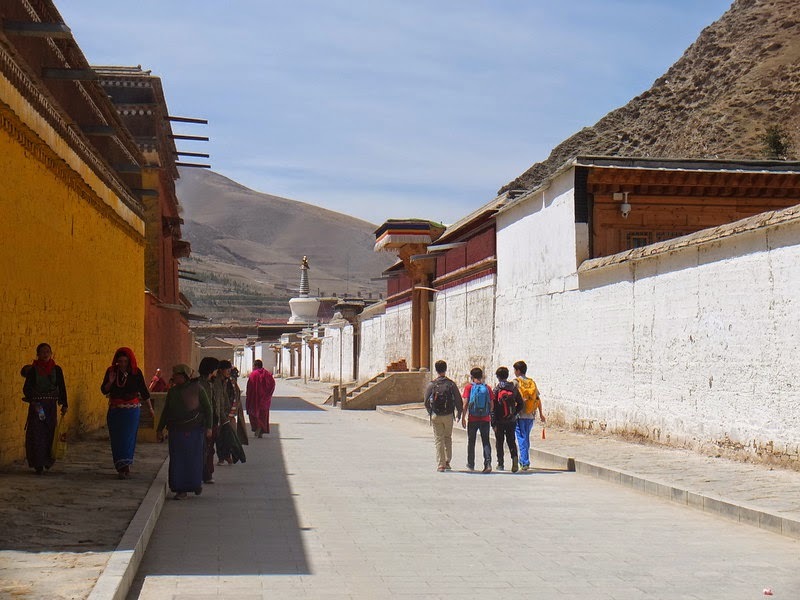 Some went to explore the monastery, others wandered around town, while others headed to school to play basketball or soccer. For the CAIS students, this school was the only Chinese campus they had been on except for Sanfan Middle School in Beijing – and the differences were stark. For many HETP kids, the CAIS kids were the first foreign students (and for some, the first foreigners aside from their English teachers) that they had ever met. The CAIS students eventually returned to the hotel and had some down time before dinner – Tibetan and Chinese food at the beautiful new Dreamland (Mutok/Mengtu) hostel. After a small-group debrief of the day, we all sat at one massive table; interesting conversations were had by all! Yet another full day of activities in Rebgong and surroundings was on tap for Monday. Another crystalline sky greeted us this morning as we met in the hotel lobby. After breakfast in small groups, we met up at the gate of my former school to prepare for a full morning at school with local students. Upon arrival, we went directly to a first-year English class. While the students’ English was rusty at points, teacher Kelly W. structured the class to encourage simple-language-based communication between CAIS and local students. The fact that the lesson was part of a language unit on food additionally ensured that all students had something they were excited to share. After the first class, we joined the school for morning exercises. While the routine was different from that which they had experienced in Beijing the previous year, they nevertheless picked it up quickly. We then visited a second-year class, which allowed CAIS students to use higher-level English to communicate with the local students and learn about their lives. Afterwards, the third-year English class managed to change their schedule around at the last minute so that they would have an opportunity to have class with the CAIS kids! We had a great discussion with the more-advanced third years on unethical behaviors - and in which cases such behaviors might prove to be the ethical choice. The CAIS and local students worked together to imagine a range of scenarios, and teacher Andrew F. pushed students to think beyond their comfort zones. After saying goodbye to the students and a quick small-group lunch in the school neighborhood, we jumped on the bus for a quick ten-minute trip up to the beautiful valley of Janglung. With towering mountains surrounding lush forests, alpine meadows, a beautifully cubist village of stacked courtyard houses, two monasteries, and a clear-flowing stream perfectly suited for wading, Janglung made a great destination on this warm spring afternoon. 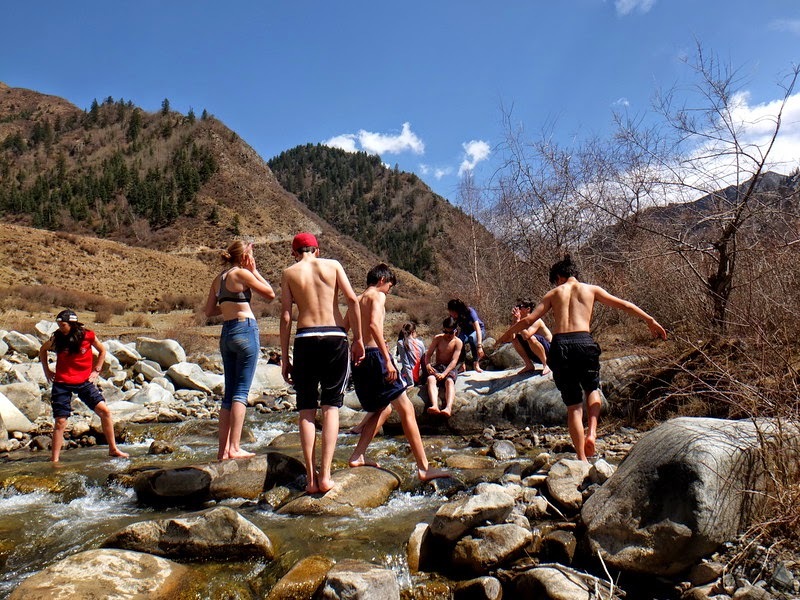 We walked uphill past a monastery and through an open valley to a large meadow, where students jumped in the frigid stream to cool off. After some time to relax amidst the idyllic scenery, we debriefed the previous day’s scavenger hunt (with waffles as prizes) before giving students a journal assignment to complete independently. With the shadows lengthening, we walked back down the valley, beautiful views of the sacred mountains Amnye Shachung and Amnye Taklung in the distance, towards the bus which would take us back to town. Several students told me over the course of the day that they had never imagined China could be like this. I hope that this comment is a positive one - or at least that the group is learning something about China’s diversity! Despite several students (and myself) falling ill over the course of the trip, spirits and interest levels have remained high. It has been great fun to share this amazing place with this group of students. 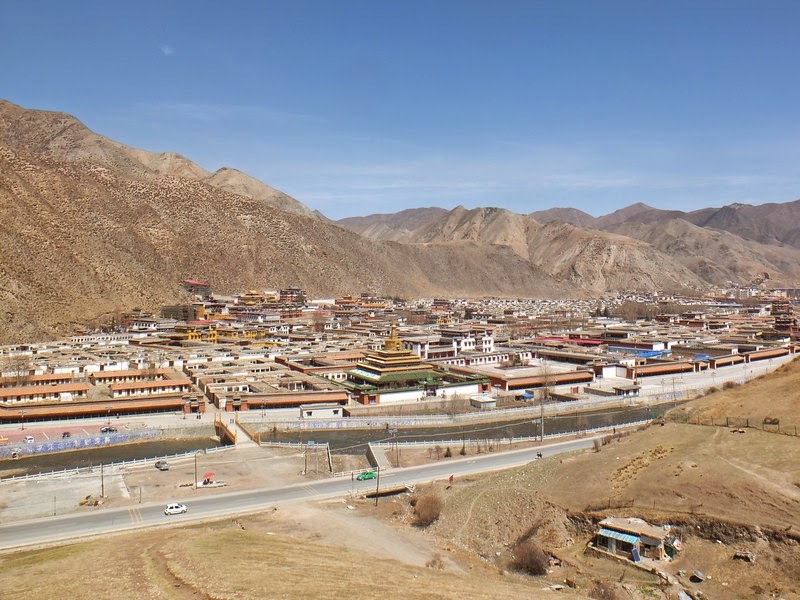 Up next: our final full day in Rebgong and transfer to Xiahe. The last day in Rebgong saw the group departing for the village of Wutun/Sengeshong, a site famous for its long history of producing Tibetan arts of the highest quality. The village, which speaks its own unique hybrid language (the Wutun language), is particularly famous for its thangka, and receives commissions for these paintings from all over the Tibetan Plateau and beyond. After a quick ten-minute drive, we walked through maze-like village alleyways between high mud walls to the beautiful courtyard home of Dondrup Gyal, an award-winning painter who would be our thangka teacher for the morning. The students were instructed on how to draw the face of a figure in a thangka - an exercise which, Ms. MacLeod would be happy to know, required students to engage in a bit of math. The face of a figure in a thangka is based on strict geometric ratios, which the kids quickly picked up. By the end of the morning, the students had completed beautiful faces which could have adorned any thangka (though perhaps they could have drawn the scaffolding/drafting lines with a lighter touch!). After lunch at Dondrup Gyal’s house, we walked across the valley to the village of Gomar, famous for its beautiful monastery and gigantic, climbable stupa. The students clambered up steep staircases and across narrow ledges to the top chapel, resplendent with golden Buddhas, where they were treated to a magnificent view of the valley. 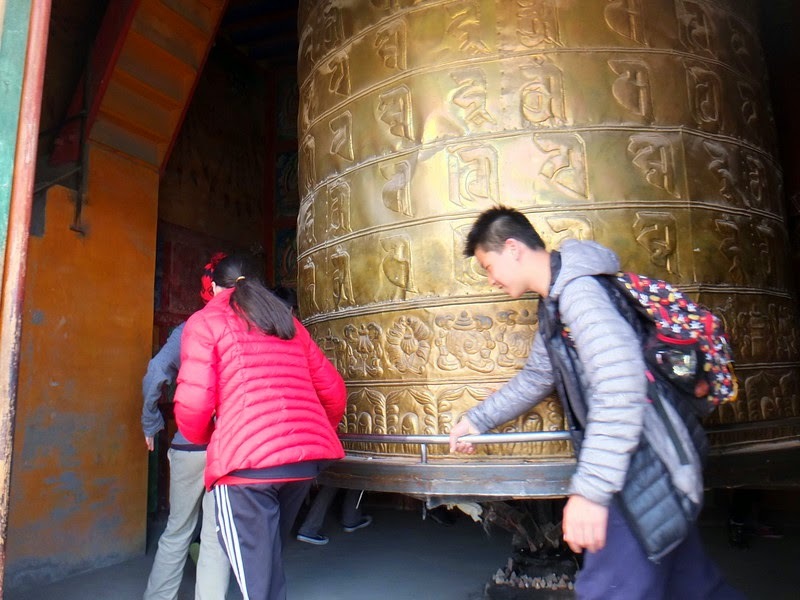 Many students also enjoyed walking around the prayer-wheel circuit of the stupa, which was lined with thousands of golden figurines. I took a group of students into the monastery proper, where we were able to visit the two main halls - one of which was centered on a massive and resplendent golden figure of the future Buddha Maitreya. The monastery itself was quite beautiful at this time of year, with profusely blossoming pear and apricot trees hanging over the ancient whitewashed mud walls and golden temple roofs. From Gomar, we got the bus back to town, where students did a bit of shopping. We met up for a delicious hotpot dinner before heading back to the hotel to prepare for the following day’s journey to Xiahe/Labrang. The next morning, we ate a quick breakfast before heading out of the Rebgong valley en route to Gansu province. 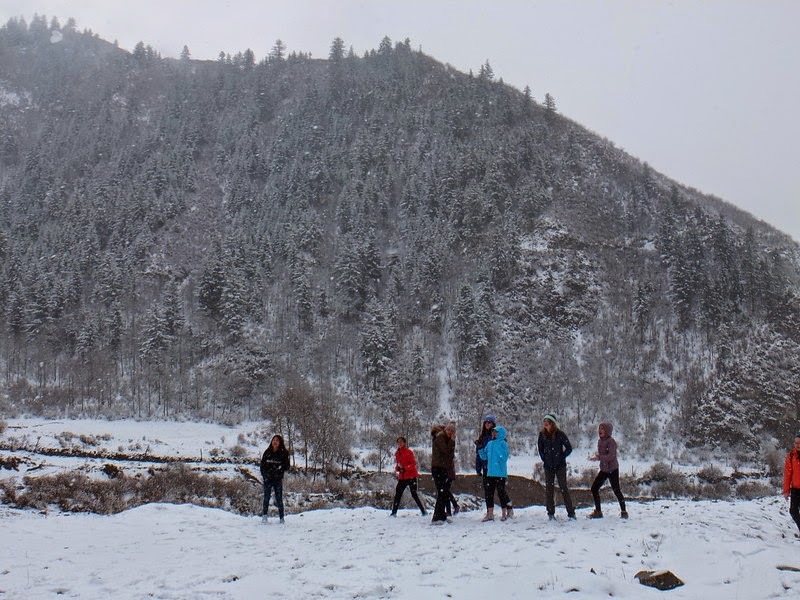 While the scenery was gorgeous throughout - barely greening farm fields in the valley, a gorge of red rock pillars, evergreen forests, and finally vast grasslands rising into snowy mountain peaks - most students stayed glued to their iPhones. playing an array of (for me) incomprehensible games. Their loss! We descended into Gansu on a rough road that - after several years of interminable off-and-on construction - still seems to have continued to degrade. Passing through the small town of Gangya, we stopped in the grasslands for a picnic and journaling session. The kids were eager to try out the Tibetan slingshots (used by herders) they had bought in Rebgong, and we had quite a time slinging yak dung deep into the grasslands. We drove the remaining distance to the town of Xiahe/Labrang and settled into the hotel. I took a group out to get a lay of the land (the monastery, the town’s one main street…the monastery…the main street…) before people decided to surrender their wallets the the vast array of goods available in the town’s stores. Feeling the airiness of my pocket, I decided instead to go on my favorite area run. By the time I had returned, students had purchased all manner of tchotchkes. Ms. Talbot and I decided to hang out at a monastery viewpoint before rounding up the group for dinner at the Tara Guesthouse restaurant. Following dinner, the group leaders decided to hold a game of mafia on the rooftop terrace. The game quickly became extremely heated, the competition sufficiently intense (and audible) that the entire town was seemingly on edge. Fittingly, the chaperones decided to head downstairs to relax before the second round began. Tomorrow: a full day exploring Labrang Monastery and its surroundings. We awoke in Labrang to another aquamarine sky and surprisingly warm temps. Ms. Talbot, Tianji and I - an intrepid group of three - decided to make a pre-breakfast circuit of the monastery, joining thousands of pilgrims and spinning thousands of prayer wheels along the three-kilometer perimeter of the massive complex. The experience was meditative, calming, and slightly dizzying - but, as always, an amazing and (moderately) enlightening journey. Upon our return, the group went out for breakfast on the street only to discover that all of the nearby restaurants were open but not actually serving food. This resulted in a concentration of all students in the “Special Tibetan Restaurant,” which proved not only mediocre but incredibly slow (nearly 45 minutes for noodles and dumplings). Following this minor fiasco, we hightailed it to the monastery for a tour inside some of the most important temples and buildings. Our monk tour guide gave us detailed introductions to Tibetan Buddhism (in Chinese), the vocabulary for which I helped explain and clear up a bit (although the kids understood the section about esoteric tantric practices pretty well!). The monastery was extremely busy that day with several festivals and a large contingent of pilgrims from Lhasa. As such, we gave the kids some time to wander about and explore this massive monastic city. Their assignment included interviewing monks, which proved difficult for many. After gathering up for lunch, we took the group on the outer kora, or pilgrimage circuit, of the monastery - a short hike that winds steeply up a rocky ridge above the monastery complex. We passed through crowds for yet another ceremony (a dedication of a new stupa) before heading uphill to the chorus of constant complaints from the group (“another hike? Nobody wants to do this! I want to go back!”). Upon reaching the monastery overlook, however, the complaints were silenced. Faced with a spectacular view of the monastery complex and town, as well as the forests and precipitous tundra-covered peaks beyond, the students paused, momentarily silenced, to take in their surroundings. After a short conversation with some local pilgrims and a couple of tourists, we did some individual journaling to reflect on the trip before heading back down the mountain for a last bout of shopping in town. We had a great dinner at a newmonastery-owned restaurant before doingone last rooftop debrief and heading towards bed. The following morning, after some pre-breakfast activities (running/monastery/shopping for different students), we had a quick breakfast before departing for Xining. The bus driver was once again interminably slow, but - after a great picnic stop and short hike (along with slingshot herding practice) near the grasslands town of Garze - we made it to Xining in the late afternoon. I immediately led a group of students to the Muslim Market and supermarket to make some last-minute food purchases, a fun and somewhat wild-spirited mini-adventure after the long car trip. 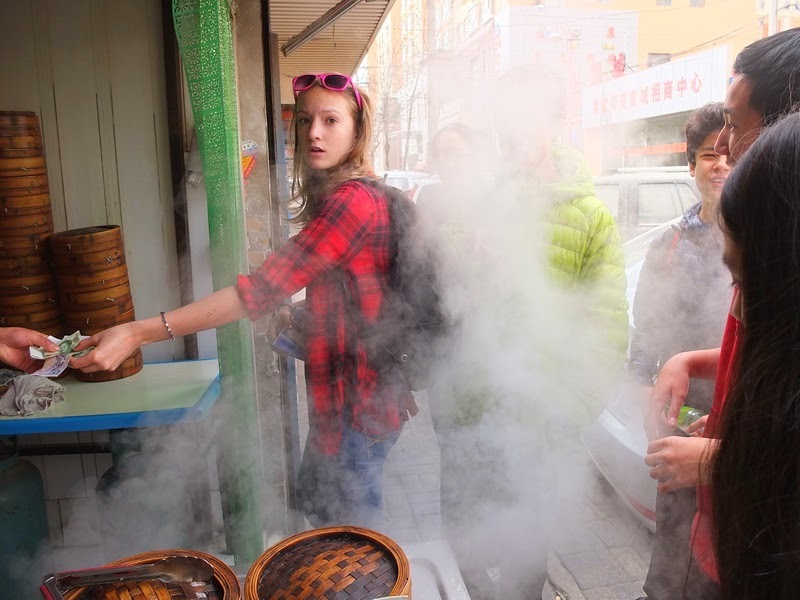 After returning to the hostel, most of the group then went back out for a delicious evening meal of shaokao (barbeque) in the Daxinjie night market area. The students loved the deliciously spicy and cumin-roasted lamb kebabs, breads, and veggies/tofu. After a quick journey around the Chinglish-filled night market, we headed back to the hostel for a last evening of fun and relaxation. We left Xining the following morning, the return journey through Beijing and finally to SFO proving hassle-free aside from three students not (yet) receiving their bags - and one student mistakenly entering the ‘US Citizens’ line at SFO customs, resulting in the group waiting an extra 1.5 hours for him to exit! Regardless, everyone made it through the process intact and is now resting up. Despite (and partly because of) the expected and unexpected twists and turns and plan-changes induced by rural China, we had a great trip. Everyone involved - guides, local students, home stay families - repeatedly told me how fantastic this group was: the kids were constantly open to trying new foods, having new experiences, and participating in a wide range of activities. With characteristic creativity and joie-de-vivre, the group was nearly always in high spirits, singing and dancing and fooling around on the bus rides, hikes, and transition periods. All in all, I had a fantastic time introducing your kids to (what are in my opinion) some of the world’s most special places - and I hope that your kids learned something and had fun along the way. And make sure that you exercise patience when washing the kids clothes, for the smell of yak-butter and juniper incense, like their associated memories, will remain pungently fresh for a long time to come.